Wir freuen uns, die Presseerklärung der CALL (Church Action on Labour and Life) Network der Conference of European Churches (CEC) anlässlich der Konferenz „Shaping the Future of Work – a faith based contribution to the ILO Centenary Initiative“ zu veröffentlichen. Die Konferenz fand am 27. November 2018 in Brüssel statt und wurde von der International Labour Organisation (ILO) und der CALL, bei dem auch Mitglied des Europa-Ausschusses mitwirkte, gemeinsam organisiert. 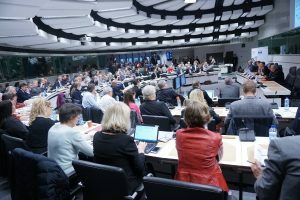 On Tuesday, 27 November, nearly 200 people gathered at the European Economic and Social Committee for “Shaping the Future of Work,” a conference addressing new challenges, while also looking forward to the 100th anniversary of the International Labour Organization next year. The CALL (Church Action on Labour and Life) Network of the Conference of European Churches organised the event in cooperation with the Commission of the Bishops’ Conference of the European Union (COMECE), other Catholic partners, the Evangelical Church in Germany (EKD), and the International Labour Organization. The conference also had an interfaith dimension, with representation from Jewish and Muslim communities. Presentations and discussion contributed to ongoing debates about extraordinary changes in work as a result of digitalisation, automation, robotisation and advances in artificial intelligence. The ongoing climate crisis also informed this exchange. Both Christians and representatives from other religions advocated putting people at the centre in dealing with transitions in work. Labour is not only about material wellbeing, but should remain a place where a person can flourish, serve society, and care for Creation. Paid work—along with labour in the home and volunteer commitments—should empower people to actively participate in society. In this view, new technologies might offer liberation from dangerous, tiring, or boring work. The future of the social protection system, which in many countries is related to personal income and the workplace, was also the subject of lively debate. Education will have to adapt and guarantee that as many people as possible have access to the “new” world of labour, and tax systems have to allow for all members of a society to lead a dignified and decent life. For the complete programme from the conference, please click here.